Invoice processing is a crucial task that every business owners hates at the end of the month. You might land up with a low score of customer satisfaction if you make mistakes in the invoices. It is essential to calculate the invoice every single month without any delay. Emailing: Assume you already hired an outsourcing company to create your invoice. The next step is to send the invoice details to your agent. The most common method of sending invoices to the outsourcing company is via email. You can attach invoice details as PDF file and send it to the agent. When you email the invoice, it will be instantly delivered to your agent. Dropbox: Dropbox is a cloud storage application that offers file sharing feature. You can easily share the invoice files with the people you trust. You can lock your folders with passwords and give access to a few. It automatically backup the files and allows access to your files from any place in the world on multiple type of devices. Client remote server: It is a centralized network where the computers will be interconnected to the client computers. It gives access to each other’s’ resources like files or applications. 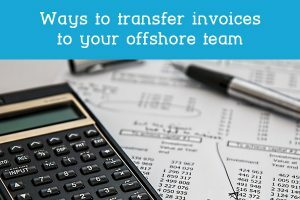 You can easily share the files with your outsourced company and update the invoice. Google drive: Google drive is an easy way to share the file. You can simply copy the file into Google drive and give access to any number of people. Anybody who has the access can access the files and make the changes or upload new files. If you are looking for an experienced outsourcing company, who can handle all your invoice processing work, contact us! We provide advanced technological services for small scale as well as large scale companies.